After you’ve been blogging a while, you’ve surely come across things other people do on social that drive you nuts. As someone who’s been in marketing communications for years and years, I have extra Spidey senses when it comes to the way people communicate (which makes me not only hyperaware but also HYPER-PICKY). Sometimes I’m in awe of the sheer brilliance of a blogger’s Instagram images or clever idea for a Facebook post. Other times, I just shake my head. These annoyances pretty much take the cake. Of course, there’s no RIGHT way to use social. I get it. But still, these are some common social media marketing mistakes that come up in just about any pet peeve convo. Auto-posting basically posts EVERYTHING you share on Facebook to Twitter. As a follower, you often have to go to Facebook to THEN go to the final destination (like a link to a post). If you’re sharing an image on Facebook without any accompanying text, as some bloggers often do when sharing a quote, it just tweets out like “fb.me/ccjiotw” which looks spammy. Or if you write something longer on Facebook, it gets cut off because you have more space on Facebook than Twitter. Plus, people who are on Twitter are on Twitter. They don’t want to be on Facebook at the moment (or they avoid Facebook altogether). So they’d rather see the content ON Twitter versus being driven to Facebook. What to do instead: First of all, disconnect that puppy! The quickest way is to head over to facebook.com/twitter and then click “Unlink.” Then use something like HootSuite or Buffer to post to both places at once… with a custom message for each (see #11 for more on that). Too many hashtags just looks desperate. No matter what the platform. I see spammy-looking Instagram posts with 25 hashtags in the description or the tweet that’s hard to read because there’s a #hashtag #on #almost every #word in the #sentence. My head hurts just reading that. But well-balanced hashtag use isn’t a “one size fits all platforms” kind of thing. For example, I think you can get away with more on Instagram than you can Twitter, especially if you paste them into the first comment after you publish the image. For Twitter, when you only have 140 characters, it just seems like overkill. And Pinterest? Don’t even use them. Like we tell Pinning Perfect students, they aren’t native to the platform (translation= they don’t work like on other platforms) and Pinterest says they’ll ding your pin if you use too many. What to do instead: Keep your hashtag usage in check. On Instagram, use all those hashtags for the first comment instead of having them all in your caption. A caption should have no more than three. Simple as that. Posting too much social media content at once on a consistent basis can turn your audience off because they aren’t seeing as much content from a variety of people. So cut it out (said with cheesy Uncle Joey hand gestures). What to do instead: For Pinterest, if you have a lot of stuff to pin, consider if the pins for personal use makes more sense to put on a secret board instead of sending it through your feed. 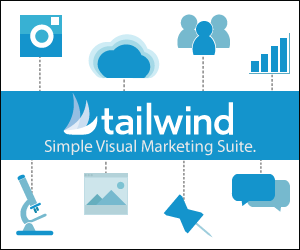 If you’re pinning stuff your followers would love, then try a scheduling tool like Tailwind Plus (affiliate). For other platforms, just be mindful on how many times you’re posting in a row and save things for later when possible. I see this mistake ALL the time. But if you didn’t know this? No worries. I see BIG brands to this too. Guess what? That doesn’t go to all your followers. Any tweet that starts with @ is considered a reply. Only people who follow BOTH you and @waltdisneyworld will actually see it. Since they follow you both, they can see replies since your Twitter feed is public. What to do instead: Either re-word the sentence so it doesn’t start with @, or you go the lazy route and just add a period in front of the @. I’m lazy and always add the period! If there’s one that thing that’s sure to get me NOT to follow you, it’s for you to follow me then immediately say “Just followed/liked you! You can follow me too!” Or on Facebook, this happens too: “New like from blahblahblah. Hope you’ll like me back!” It’s pretty much the equivalent of comment vomit. I chalk this one up to a newbie mistake (for the most part). Until you get entrenched in the blogging world a little more, it’s hard to wrap your head around exactly HOW to get new followers. So this tactic sounds innocent enough. But, wanna know the truth? You have to EARN followers and likes. What to do instead: If you want people to like or follow you back, interact with them. Respond when they ask a question or leave a comment on a post. And of course, it’s pretty likely someone will follow you when you follow them. But just don’t ask for it. I get it. Quotes WORK. Good quotes inspire, motivate, and even just cause a good laugh. But just because quotes work doesn’t mean 90% of your social media stream should be quotes. If someone’s trying to decide to follow/friend/like you, they don’t want to see back-to-back-to-back-to-back-to-back tweets of quotes. What to do instead: Use them! Just don’t let them overtake your social universe. You CAN have too much of a good thing. LinkedIn is a place to put your work experience, highlight your awesomeness, and be visible to brands looking for bloggers. On Twitter you can get away with a cute or clever Twitter handle, but on LinkedIn? You’re a real person with a real photo. And you’re a real professional too! If your LinkedIn name sounds something like “Melissa Carolinamommy” then you. must. change. that. Okay, if you’re a blogger just on social to chat with friends and post pictures to friends, then by all means keep your profiles private! Buuuut, if you’re a blogger looking to grow your blog traffic, then you have to make your accounts public. I’m not talking about your personal Facebook profile- I keep that one tight to my vest. But platforms like Twitter? Make it as easy as possible to follow you- a private account is an extra hassle most people won’t bother with because they can’t see your content before they decide to follow. What to do instead: If you want to keep some accounts private, then do NOT link to them from your blog. Otherwise, make those profiles public and you’ll instantly notice you grow your following faster. Social media is a great place to start in getting a good contact, but not like that. Plus, while you should keep pitches brief, you can’t say all that much in 140 characters. What to do instead: Ask the brand who you should reach out to about opportunities for bloggers. That way you’re taking the actual pitch out of the public space. Or send a private message on a brand’s Facebook page. I know. I know. Group boards used to be the secret sauce to successful pinning. But with the Smart Feed? Not as much. Yes, they’re still important, but you don’t need to pin to 100 collaborative boards. See which ones are actually getting you repins and ditch the rest. What to do instead: Remember that search is king on Pinterest now, not group boards. Use keywords in your pin descriptions, but still make it sound conversational. In Pinning Perfect, one thing we teach is to severely limit the number of group boards you’re on and show you how to write effective descriptions that get found in search! When you send out a message on social, do you copy and paste it into every social platform? Different platforms call for different approaches. On Twitter, keep it short. On Google +, you can go longer, making your post keyword-rich. On Instagram, maybe you share a behind-the-scenes image from the craft you just posted or the recipe you just created. What to do instead: No, you don’t need to completely rewrite every single thing. And sometimes it’s short and sweet enough for more than one platform. But for the majority of your content, adjust and tweak it a little to cater to each audience and platform. What’s one thing you think bloggers should stop doing? Any of these resonate? Don’t hold back! It’s kinda like therapy for social media lovers. 11 things that annoy your social media followers- are you doing any of these? Oh, thank goodness, I thought it was just me! I appreciate that you’ve gone public with your pet peeves. Please let me add one–and I know I’ve mentioned it to you before–if you’re asking for shares (like in a niche FB group), be sure you’re actually using a “share” plugin and edited the settings with your own social media accounts. If you make it too hard for us–now we have to go search for you on Twitter and cut & paste–it’s less likely to be shared! Ah yes, that’s another one that drives me nuts! The jingles. This apt34. The hang about moons days mornday. All great advice! I’m thankful to see I don’t do most of these (I do copy/past the same stuff from Facebook to Google+, but I’m such a newbie to Google+ that I never know if I SHOULD do something different!). Love your blog! Yeah Google + is still kinda like the new frontier! I’d check big players like Rebekah Radice and Peg Fitzpatrick and mimic the structure of your posts like theirs. They are amazing on G+! I was wondering the same thing about Google + too, Beks. Sometimes I do add a little more content to my G+ posts, though. Thanks Melissa for the advice! I will be checking those two out. Great post! Number 5 is so annoying! I usually delete that kind of comments on my Facebook page. Yeah I see #5 so often and I don’t think they realize it makes people NOT want to follow you. I use the same message if it’s really short, but otherwise adjust. And that’s only between FB and Twitter. I always go longer on G+ using keywords. I actually edited this post a little to reflect that because it’s not that I NEVER EVER use the same message! Thanks for sharing tip #4. I had no idea that if you start a tweet with @ that if doesn’t go to all of your followers. #4: News to me! Good to know! #1 is a biggie argh-a-vator. When I click a link on Twitter I want to go to the thing they want to show me. If what they want to show me is actually on their blog, please send me to the blog page, not to Facebook, not to Pinterest. That’s one reason I guess I like quotes. There are no false leads with a quote, no link to trust. This post definitely rings true in more than one place. Hashtags sometimes drive me crazy, and when I repin on Pinterest, I usually remove them. I didn’t know I should hashtag on Instagram though. Thanks for sharing! I love that people tweet out great content they find – but it irks me a bit when they don’t include the twitter handle of the creator of the content. I totally agree with this! It’s great that you want to share their content but it’s also nice if we know where to find them! Love these! Now let’s hope everyone reads it and makes the changes. These are great! I have to say I’m guilty of #7…been meaning to update for probably the last year! Time to get to it. Piquora did a study on hashtag use on Instagram. They found that 5-7 hashtags is the optimum number (for Instagram). Totally agree that it is annoying when 20 billion are used…I especially notice that with the dog and cat bloggers. #3 bother’s me a lot. Especially offenders on Instagram. And if someone is a repeat offender, I will usually unfollow. More great info! Was thinking about investigating collaborative boards but am now going to focus on much better descriptions for my pins. They have been a bit sparse. Whew! I don’t think I’m doing any of those. I hate when someone follows me and then asks me to follow them back. I also don’t like it when I follow someone on Twitter and they follow-up with me. That’s probably just me but I don’t need that. And like you mentioned, I don’t like it when someone posts something to Facebook that was also on Twitter when it’s designed for Twitter. Ok… I will say that I use a lot of hashtags on Instagram. BUT I don’t use them within my sentences, I add a group of them in a comment after the first comment, so they dont show up when it syncs to Facebook. I get a lot more interaction that way! Yes, yes, yes! I hate it when bloggers don’t tweak their messages for each platform, and especially don’t like seeing FB stuff in my twitter feed. If I have a discussion going on FB that I think my twitter followers would enjoy, then I say something like, “Have an opinion about…? Join our fantastic discussion on FB and share your thoughts!” That usually works better! Regarding group boards, I’ve been doing a lot of research and tweaking myself with the new smart feed, but can’t figure out if just being a part of a lot of group boards is bad (even if you don’t pin to them), or if it’s just the activity of pinning. I’m wondering if I should go through and delete! These are definitely some of my pet-peeves too! That being said, I’ve made some great connections on social media and it can be lots of fun when used correctly! What do you mean no longer use keyword rich posts on G+? Just discovered your blog and this list is great! Love the gif btw. I remember that on “Full House”. Alas I am the newby who has followed the crowd by doing most of these. (Hanging head in shame) but now i know better! And I really didnt know about the asking for likes thing. Most all of the blogs and pages I follow have asked for a ‘return the love’ and yes I admit I have asked as well! (Hanging head in shame for the second time) I will definitely clean up my act after reading this! I really liked this post and in all seriousness, I think taking the cues form this blog will make me and my blog look more mature as well as be taken for a more serious writer! thank you for your help! I’m guilty of #1. I linked up the 2 about a month ago and have questioned that decision ever since. This was the confirmation I needed to go back and unlink them. Thanks! Great list! I also hate it when people use hashtags for things that are obviously not and never will be trending topics. Using too-specific words or making it too long is not a helpful hashtag. Great advice and very helpful. Thank you! Fabulous list! Ugh I’m so guilty of #1 though. I just thought it would be easier and save time to have them connect. I see a TON of people doing that. But I think I will go disconnect them now. As a new blogger I nervously read through these 11 things and guess what? I don’t do any of them!! What a relief. I am so happy I have come across your blog and I am loving reading through all of your wonderful tips, tricks and advice. really great post and thankfully I’m not guilty of these, phew! but I do get annoyed by many of them. I love the EARN your followers because it’s about engaging with your own audience. My latest pet peeve on insta where “girls” are looking for a “good time ” and follow you randomly – so annoying!!! Great article! Nice to learn some new things – especially to do with Pinterest, I admit this is the SM platform I struggle the most with! Trying to work on it atm, thanks for sharing! Yes, the “Will you like me back?” on Twitter or Facebook is just spammy. It’s a sure fire way for me NOT to follow you! I’ve wondered about the abundance of hashtags on Instagram, and whether or not putting most of them in a comment after you’ve posted the picture works?? Would that picture then be searchable for those hashtags that are in the comment?? Hmm…something to research! Does Pinterest penalize collaborative boards or is #10 more about pins going to everyone on the board? I have boards that I “collaborate” with my personal account and my business account so I can pin to the boards with either account. For most collaborative boards, Pinterest has unofficially penalized them. They aren’t getting seen in the Smart Feed as often and so pins to those boards are getting fewer re-pins. Again, some people might not be seeing this, but most people are seeing it in some of their boards at least. I know I have. You might consider a secret collaborative board for that! No – it is not just you, Melissa. That linked Twitter/Facebook stream thing drives me BATTY. I also stopped linking my Instagram account to Twitter for the same reason. If I want to post a photo on Twitter, I do it manually to make it easier for Twitter followers to see the pic instead of having to follow a link to IG. (I do keep my Facebook and IG accounts linked though because it’s seamless). Great post. Pinning to share with all the writers In the Powder Room! I’m guilty of quotes, I suppose. LoOoove them! Anyhow, what really BUGS me is when people post pictures of their boo-boos. You know, cuts, scrapes, bruises, surgery stitches. STOP IT! Seriously? People do that? Wow. I can understand posting a pic of your kid’s covered-up booboo, but the actual wound? Gross. YES! I tell my clients and friends this stuff all the time. I love every pet peeve you’ve shared. The first one is my top one. Every social network is completely different and has completely different functions. You can’t use a toilet, how you use a sink. Can’t speak Spanish when your audience is Russian. It doesn’t make sense to do many of these. Love love love this blog. Do you mind if I share it on mine next week? Great advice Melissa – couldn’t agree more! Thanks so much for this. Really useful advice for a new blogger. I have a lot to learn! I loathe being thanked for a share…just reciprocate and move on! Great list! The follow back comments drive me nuts! I will follow you back if I want to, I don’t need a reminder! haha! Great short list. What do You think about social media aggregators? Are they good or bad instrument for sharing in social media? Lol the hashtag on almost everyword is really annoying plus the copy and paste thing to every platform is a turn off. Thanku mrs for the advice as im still gathering tips to open up a well formed in content blog, one that steals a readers attention. Excellent advise! Thanks for these “nuggets” of things to stop doing. Looking forward to the next Pinning Perfect class. I personally don’t care for long drawn out blogs that read like a textbook. Make it concise because most people aren’t going to read it if it’s too long anyway. I don’t care if it’s short, a boring read is a turn off. Put some personality in it. Number six is the number one reason I immediately unfollow people on Twitter. If the automated message asks “where can I find your work?” I will want to follow them forever. Yes to all of these! I am guilty of the hashtag one, but only at PTA conferences.. or if an influencer campaign could possibly lead to another one. #1 drives me BATTY! I don’t think people even realize how much they are hurting their follower count by cross-posting everything! I could understand if it’s a blog post being posted everywhere, but your random thoughts? Nope. I agree Tina re: Team Follow Back! I rarely do the follow for a follow threads unless we don’t have to follow everyone. I don’t want to follow people just because they followed me, and most likely they only followed me in order for me to follow them! I’m not typically a fan of share threads, either, for similar reason. I don’t want to sound like a jerk, like I don’t want to share fellow bloggers’ content. I’m happy to share — IF it fits with what I would otherwise share. I never do share threads anymore, because it’s pretty much always a requirement to share every link in the thread, and some of them just are contrary to natural sharing for me. It’s better, IMO, to have a place to gather the things people are currently looking to have shared, and let people choose from the list those links that are logical and appropriate for their audiences. Great list and a reminder as a newbie of what NOT to be doing! I’m curious on your thoughts on having more following than followers. I’ve seen many bloggers sites (Pinterest, Instagram) where they are following more people than people are following them. I’m curious is this is a good strategy to increase your numbers. Personally, I think it looks strange but then, I’m still trying to figure this all out! Hi Victoria! Personally, I don’t pay that much attention to that UNLESS it’s really drastic, like they have 1,000 followers but only follow 10 back. It’s not a strategy per se, but some people follow a bunch of people in batches, then hope they get followed back, so that’s often why you’d see a discrepancy. Days of nap. The get SA you. First of all I would like to thanks for the 11 comprehensive tips on social media. Can we improve affiliate sales through social media? I totally agree with you about the following back thing. It drives me crazy when someone follows me on Twitter and if I don’t follow them back they unfollow me. I agree they need to earn my follow just like I need to earn theirs. If they like what I’m posting then follow me, don’t just follow because you want a follow back. Lots of solid advice! Thanks! This is a great topic and you got a lot of feed back. I am not a marketing expert but I agree with all of your points. It is easy for me to see ones who are only looking for the money or just starting out. I will definitely hang on to this post and train anyone that I coach what not to do. I am guilty of a few of these! Whoops.